Bontriage is a technology company that focuses on streamlining data and communications to help support patients with chronic illnesses. 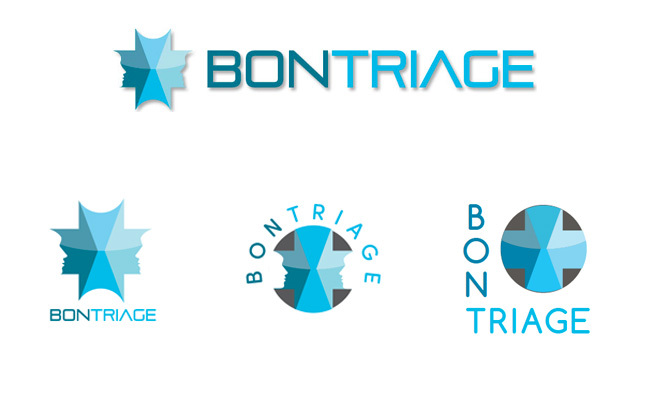 They wanted a logo that incorporated a face or faces but also a medical cross. The final logo looks like a stylized medical cross, but it also contains two faces pointed towards one another. the faces are set on arrows to underscore two-way communications. The center of the design represents an hourglass to highlight the central issue for patients, which is timely care, less waiting. During the logo development process the initial name was Victaire and the message was to show integration of thriving health with technology, Here are the samples that were done for Victaire.